I decided to try out the muffin tin theme from this blog (you can push the button above to take you to her blog and join in! ), because it seemed like a fun way for Pierce to have lunch. Today's Muffin Tin Monday had no theme to it, so I created one of my own. I went with a farm theme. 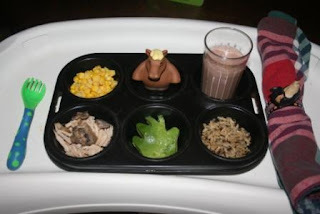 Corn, Chocolate milk, shredded pork with mushrooms, "ranch hand" avocado (just used a hand shaped cookie cutter to make this shape), and rice pilaf. I love your theme and the cow. The ranch hand is just a clever idea. Thanks for stopping by. Great theme! I love the "ranch hand"! OK, I just love your little critter peeking out of the tin. Too cute!!! Very cute! Your boys are adorable. Hope they get better quick.